In comparison students presented with heavy textual content at the same time as spoken words, leads to poor outcomes. Analysis of brain activity has revealed that when a student is looking at an image at the same time as listening to someone speak, completely different parts of the brain are activated. This means these two sections of the brain don’t interfere. In fact the research has found that having these two different neural areas activated at the same time enables the brain to attend to, understand and memorise information better. Just as humans enjoy watching TV and movies, the combination of images and spoken words far exceeds learnings achieved through individual formats. Through mimicking film and television as much as possible, these research findings should assist teachers and lecturers develop presentations with greater inclusion of visual images to improve engagement, understanding and learning outcomes. However, in contrast research by the SLRC indicates that presenting text-heavy material, such as powerpoint, chalkboard/whiteboard/blackboard and hand-out material, when used in combination with spoken words, is detrimental to learning outcomes. Human beings can really only pay attention to one person speaking at a time, but what the SLRC research has found is that reading and listening to speech actually use the same region of the brain. When you are reading, to the brain this is essentially the same as speaking the words in your head. This makes it virtually impossible for the brain to properly hear and understand two things at once. In a classroom situation, when students are presented with oral speech and written words at the same time they are forced to choose which one to fully pay attention to … and anytime they switch between the two, valuable information is lost. 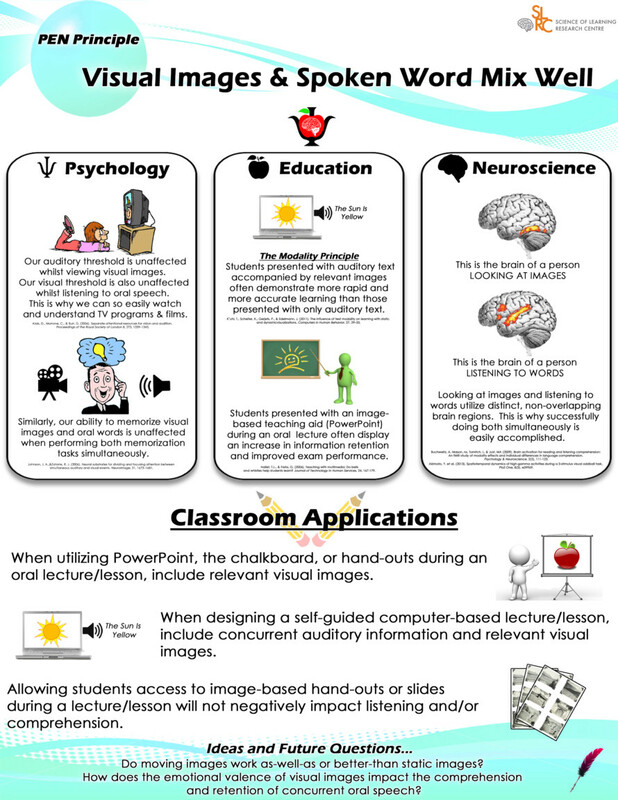 From a teaching perspective, the research shows that just as including visual images into presentations enhances learning outcomes, reducing the amount of text-heavy material during lecturers and classroom discussions would be of benefit to students and improve students’ results.